Learn how your vehicle uses the latest technology in Stop-and-Go and Lane Centering* to make driving with cruise control simple by maintaining a preset gap between you and the vehicle in front of you. WATCH: https://ford.to/2TVpToJ. The available B&O Sound System* by Bang & Olufsen reimagines more than 90 years of audio heritage, with natural materials, distinctive design and high-quality audio for seamlessly integrated experiences. To learn more, visit: https://ford.to/2Waucd7. Action sports personality Pat Parnell takes the 2019 Ford Ranger over various terrain and explains how the truck’s advanced technology can assist you. Learn more: https://ford.to/2HHVwLP. Learn how FordPass Connect can help you move more freely throughout your day by putting the tools you’ll need to manage your vehicle in the palm of your hand. WATCH: https://ford.to/2HIWLub. We build with purpose and pride. We build trucks for the builders, which is why they are Built Ford Tough. WATCH: https://ford.to/2FncE8a. Leave no one behind in the Ford Expedition with enough room to fit eight and 9,000 lbs of towing. It is built to be a better big. WATCH: https://ford.to/2UaNdPy. Thinking about buying a 2019 Toyota Tundra? Compare it with 2019 Ford F-150 with best-in-class towing, best-in-class payload and Class Exclusive Pro Trailer Backup Assist™. * To learn more, visit: https://ford.to/2OWNOz2. We don’t back down. We put our name on it. Built Ford Proud. WATCH: https://ford.to/2FpKecH. The 2019 Edge Lane-Keeping system can help you stay in your lane, even during a moment of distraction. To learn more about this smart feature, visit https://ford.to/2TIetEJ. Thinking about buying a Chevy Silverado 1500? 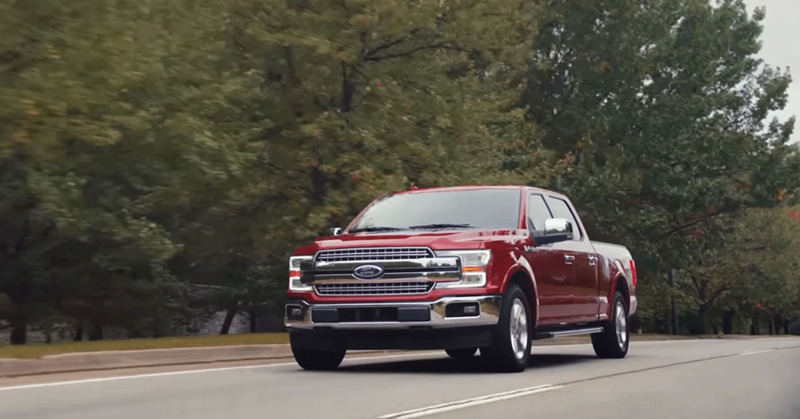 Compare it with 2019 Ford F-150* with Best-In-Class towing,** Class-Exclusive Pro Trailer Backup Assist™, and Kelley Blue Book best buy. To learn more, visit https://ford.to/2XT1wXX. Sound Ford, serving the Seattle area for the last 42 years! In our experience, there's no resisting the beautiful craftsmanship of the Ford models you'll find in our showroom. If you are in the market for a new or used car, then you have come to the right place. Because if there's one thing we love more than our lineup of new and used cars, it's serving customers like you here at Sound Ford in Renton. What are some of the new Ford models you'll find at Sound Ford? The Ford Escape, Focus, Fusion, Fusion Energi, Fusion Hybrid, F-150 and of course the world famous Mustang to name a few. As for which ones stand out among the pack: that's up to you to decide. Here, it's all about what suits you best. That's why we encourage you to keep an open mind and evaluate all of your options - many of which, we're proud to say, have earned at least one award or accolade. Of course, a new car might not be in the cards for everyone at this very moment. That's why Sound Ford also makes sure to carry a wide range of used cars and trucks to choose from as well. Thoroughly inspected for quality and integrity, you can be sure that each one meets our incredibly high standards for excellence. Why should you expect anything less? Can't wait to take your new or pre owned Ford vehicle home? Sound Ford is ready to discuss your financial options, including lease and loan specifics. Our friendly staff is well-versed in helping drivers of all financial abilities discover the best car loan and lease options available. Whether you're a first time car-buyer, had some bumps along the way and don't think you can qualify or you have years of experience under your belt, Sound Ford can help you achieve the ideal auto financing options. That means you can focus on what's really important: that shiny new or pre-owned vehicle. We want your business for years to come - not just a one time thing. Once you are the proud owner of a Ford model, Sound Ford wants to help you keep that new car as safe, efficient, and well maintained as possible. Our factory trained staff are pleased to provide you with onsite car service and repair. We utilize the latest automotive car care technology, and exclusively use only official Ford parts for any vehicle repair, or upgrade. But it isn't our diverse new and used Ford lineup or even our many auto services that set Sound Ford apart from the rest. It's our unequivocal commitment to the customers we serve. At our dealership, we don't just want you to enjoy your new Ford Escape, Focus, Fusion, F-150 or SuperDuty, we want you to enjoy the entire experience of buying it. Visit us at 101 SW Grady Way, Renton, WA 98057 today or use our online Contact Form and let us treat you right.